In the days before museums were readily accessible, Cabinets of Curiosities were fantastic microcosms that attempted to document the full breadth and wonder of the world. Known as “Wunderkammern” or “Kunstkammern,” they were astonishingly eclectic assemblages of natural wonders (naturalia), scientific instruments (scientifica), precious art works (artificialia), ethnography (exotica), and inexplicable, magical objects (mirablia) that represented their creator’s interest in understanding and ordering the world. Like the early curators of kunstkammers, neo-surrealist Jon Jaylo has collected the strange and the sundry to create an exhibit of works that mediate with the world, albeit one created from his imagination. He displaces the meaning of ordinary images – apples, houses, keys and dominoes by removing them from their expected context, defamilarizing them and storing them on canvas, the “cabinet shelves” of his own unique vision. “The Tale of Two Travelers” (Oil on canvas,122 x 91cm) shows a husband and wife improbably moving an old house across an ominous blue ocean. Their domicile restricts their vision, yet they blindly move forward, a methaphor perhaps for immigrants who struggle towards new land, hoping from greener pastures across the dark waters. The house is the couple’s container, the vitrine that keeps them seemingly safe yet cuts them off from reality. 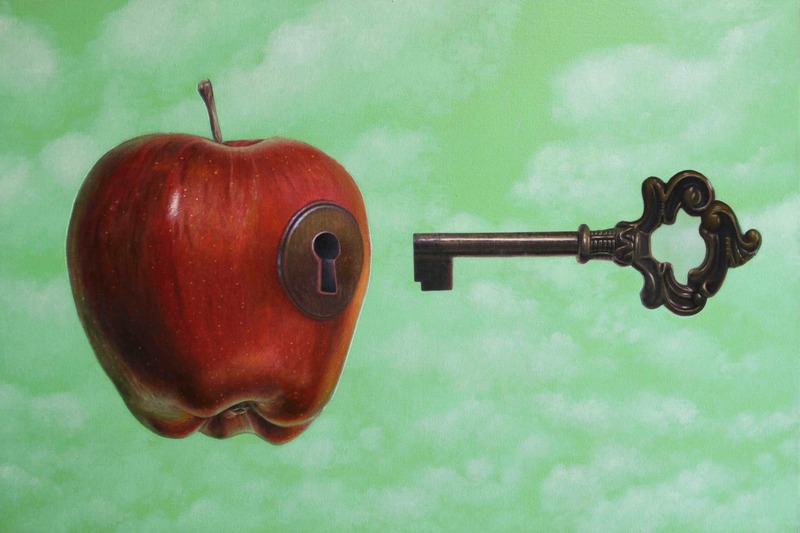 “Unlocking Knowledge” is a small work featuring an antique key about to open an improbable lock on a red delicious apple –- the traditional symbol for the fruit of knowledge of good and evil. But what sort of knowledge is contained inside? 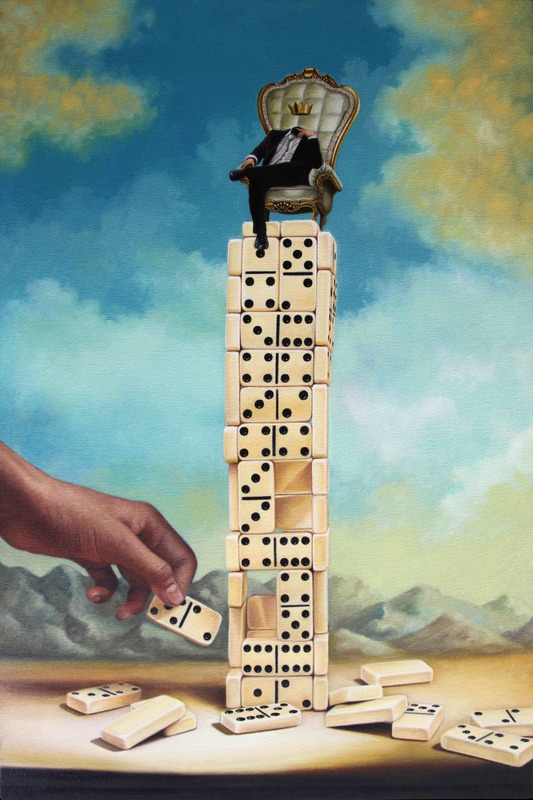 In “Finding Humility LR” a headless king sits on a tower of dominoes. A mysterious hand is shown to the left — either building the tower or perhaps taking it apart. Like the fate that befell Ozymandias in Percy Bysshe Shelley’s eponymous poem, the impending disaster is a reminder to those who have grown mighty that no matter what they create or how confident they grow, time will tear them all down. All the paintings in Jaylo’s Cabinet of Curiosities form an obsessional and fantastic collection that celebrates the strange and numinous . His work is a reminder that Surrealism is alive and well, persisting as a meaningful reference for the artist’s particular visual sensibility, one where ordinary images are combined in unusual ways to suggest another, perhaps darker plane of reality. This is the sole unifying theme of the show — that of Jaylo wanting to guide his audience away from familiar things towards the unfamiliar, like a stack of kunstkammer shelves that lead towards the mysteries of Life. Andre Breton’s 1928 Surrealist book Nadja ends with a ringing assertion: ‘Beauty will be convulsive or will not be at all.’ Jaylo’s work showcases an uncanny, convulsive beauty of its own, one which causes a frisson of the senses, filling the viewer with wonder while at the same time unsettling ordinary sensibilities with his extraordinary vision.